Quick Installs of Travertine Flooring - PetraSlate Tile & Stone is a wholesale supplier of quality flooring products from around the world. Visit us online to view our products Gallery. Travertine tile is a natural product, made from sedimentary rock formed in and around the beds of hot springs, limestone beds, or near geysers. Travertine has been a construction material for centuries and is still popular for many visual projects like backsplashes, countertops, walls, and travertine flooring tiles. While travertine is a limestone, the exposure to hot springs and geysers exposes the material to an additional chemical process that causes the stone to be somewhat porous. To understand the durability and long-lasting quality of travertine, understand that Rome’s famous Colosseum was constructed entirely from travertine. Travertine is light colored, generally ranging from near white to beige to a golden-reddish hue. Because travertines surface texture can be variable by nature, the product is often further processed to different finishes: polished, matte, or brushed. The porous material may be filled with grout, or left unfilled, creating a unique look, no matter which finish is preferred. Travertine tiles are usually easy to match in case you need to replace or extend your tile coverage. Each tile has a unique look and pattern. Matching pieces is not a problem. Easy to clean though the material needs to be sealed to prevent accumulation in the natural pores. PetraSlate offers 17 different styles, patterns, and cuts of travertine stone veneers for floor and wall coverings. Tiles are available in sizes of 3”x 6”, 4”x 4”, 6”x 6” and 12”x12”, depending on the product. The tiles are ½” thick and originated in Turkey. Each square foot of tile weighs approximately 6 lbs. Laying the tiles is a relatively quick process for experienced tile layers. The mix of sizes will depend upon the pattern you prefer, of course. Versailles patterns utilize a variety of sizes to create an eye-catching appeal. 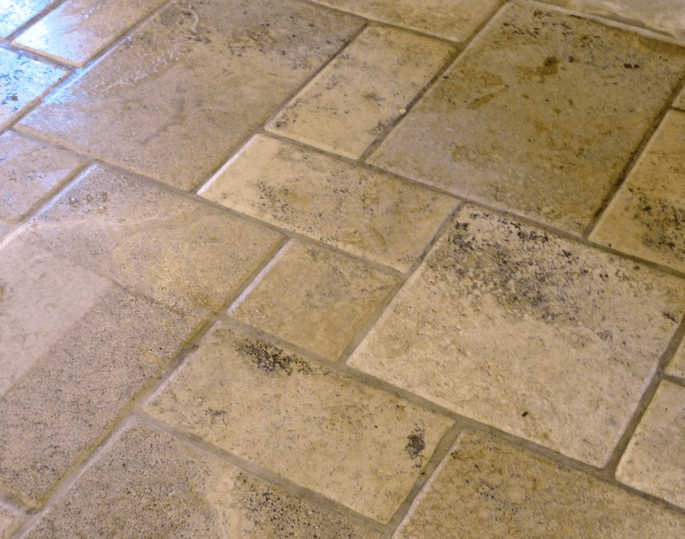 For more information about travertine tile and quick installation, contact PetraSlate in Denver at 303-280-9595 . Our experienced sales staff will provide information regarding the selection and installation of travertine tiles.